This calculator will allow you to quickly total up your weekly time sheet hours and then compute your total regular and overtime wages for the week. Includes 3 In/Out columns and a printable time sheet report feature so you can print out a copy of the completed time sheet calculations. If you would like the calculator to calculate your gross wages, enter your regular hourly rate of pay (without the dollar sign). Otherwise, leave this field blank. Choose your overtime setting and, if you would like the overtime rate calculated for you, enter a multiplier in the field provided. If you would like the calculator to estimate your gross wages, expand the description in this row and choose the overtime settings that most closely match those of your company. If you would like to customize the titles of the pay period days, open and complete the pay period settings panel. You can also select how you wish the calculator to display time totals. Select the day of the week you want the time card calculator to start at. The Day column will automatically be filled in with the correct days. If you want the date included for each day (e.g. Mon 1/1, Tue 1/2, etc. ), select the month, day, and year of the first day of the pay period. If not, leave the month set to N/A. Would you like to spend more of your time engaged in profit-generating activities and less time totaling up work hours and gross wages? If so, then you're going to love this calculator. If this is your first time here, please consider all of the following features before leaving. Up until now, adding up your time sheet hours was probably a real pain. Because most offline and hand-held calculators don't have a ":" (colon) key to represent hours and minutes. Hence you have to convert the minutes into tenths of hours before you can add up work hours. No worries! This weekly time sheet calculator allows you to enter times without any special characters at all! In fact, you can even enter times as military times if you want. And again, no punctuation required. And you will also be pleased to discover there are no drop-down time or AM/PM menus to slow you down, plus will you never need to hit the back button or wait for the page to reload to recalculate. All the magic happens on one page! Compute the gross wages for the week -- including any overtime pay. If you use an offline calculator to add up work hours you will spend extra time converting minutes into 10ths of hours (15 minutes = .25 hours). No more! The time sheet calculator on this page will automatically convert minutes to 10ths of hours. 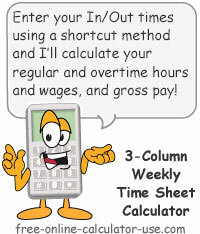 The weekly time sheet calculator also includes a Printer Friendly Report so you can print out a work-hours and gross wages report for each employee -- without printing everything else on the web page. Not only will this save time and printer ink, but you will also impress the payroll clerk or accountant with how neat and easy-to-read your hour and wage reports are compared to those that are still submitting hand-written reports. Enter the name of the person you want to enter and track hours for. If you would like the calculator to calculate gross wages, enter the hourly wage rate and overtime settings for the person you are entering and tracking hours for. If you would like to customize the pay period day titles, either select a weekday or a specific date to start the pay period on. The calculator will instantly update all 7 day titles to accommodate your preference. For each workday in the pay period, open the corresponding day title and enter your In and Out times for that day. The calculator will update the total each time you enter a new In/Out pair of times. Once all In/Out times are entered for all of your workdays, and if you completed the required regular and overtime wage entries in the top section of the calculator, you can tap the "Calculate Gross Pay" button. This will populate the hours and wage detail table located just below the button. Tap the "Printer Friendly Report" to open a wage and hours report that you can print out and file for your records. If you need to email the report to your payroll clerk (if your printer software provides a Print to PDF feature) printing to a PDF file will allow you to attach the report to an email.